Spread over 1,666 acres, the complex is both a shooting location as well as a tourist haunt. 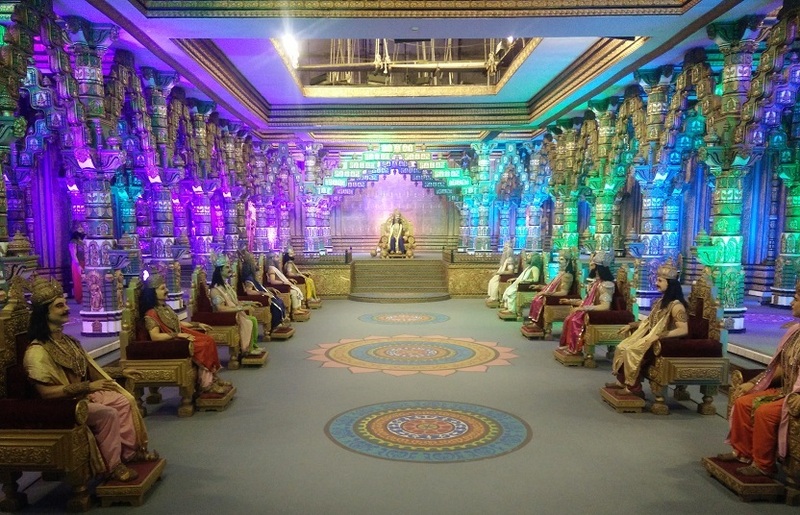 We were on a day tour of Ramoji Film City on the outskirts of Hyderabad. Spread over 1,666 acres, the complex was built in 1996 by legendary Telugu film producer Ramoji Rao and thrown open to tourists a few years later. Inside the jail complex were dummy prison robots shaking the bars of the jail doors simulating an impending prison break. There are replicas of all sorts of real and imagined things inside the largest film studio complex on the planet (it has been certified by the Guinness World Records). 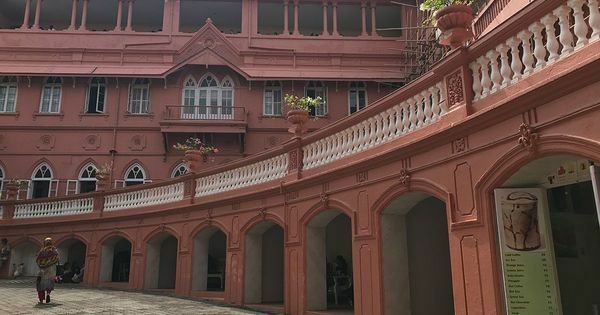 The tour includes several familiar locations, such as a police station, a government building, a mansion and a vegetable market, as well as replicas of Indian tourist sites such as the Buland Darwaza in Fatehpur Sikri, the Taj Mahal in Agra, and the Brindavan Gardens in Mysore. This apart from sites that defy categorisation, such as a Japanese garden, underground caves and a children’s puzzle garden. The Guinness World Records-certified Ramoji Film City. Photo by Archana Nathan. A set depicting the interiors of a palace. Photo by Archana Nathan. The film city claims close to 15 lakh visitors every year. And yet, Ramoji Film City is a shooting spot first and a tourist site later. At least 2,500 titles have used Ramoji’s sets since it was built, including the Hindi films Bade Miyan Chhote Miyan, The Dirty Picture, Krish 3, Dilwale, Ra One and Chandramukhi, the Hollywood productions Beeper and Quicksand, the Tamil movies Vivegam and Spyder and nearly every significant Telugu project. The cameras clicked away. Stops for selfies were inevitable. When a film unit decides to shoot at the film city, the location becomes temporarily out of bounds for tourists. Since the film city is spread over a large area, it is easy to hide shooting spots and restrict the tourist circuit to other sites. Sometimes, film production units that use the plethora of empty spaces within the complex to build extravagant sets leave them standing when the productions have been completed. These sets are added to the tour. For instance, the remnants of the sets of SS Rajamouli’s Baahubali blockbusters, designed by Sabu Cyril, are now open to the public. 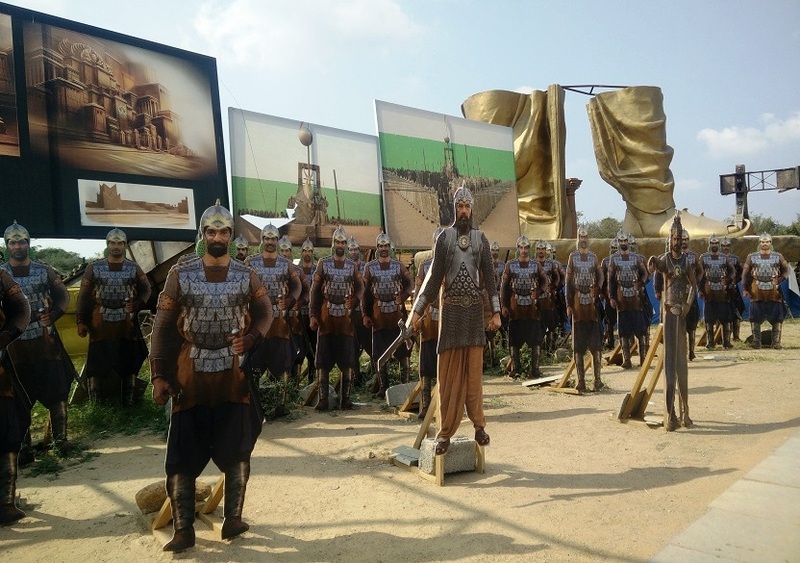 Cutouts of characters from Baahubali. Photo by Archana Nathan. Remnants of props for the Baahubali movies. Photo by Archana Nathan. The film city has been conceived as a one-stop-shop – a supermarket, if you will – for producers. Everything from readymade sets and locations to film equipment and services are available at one place. 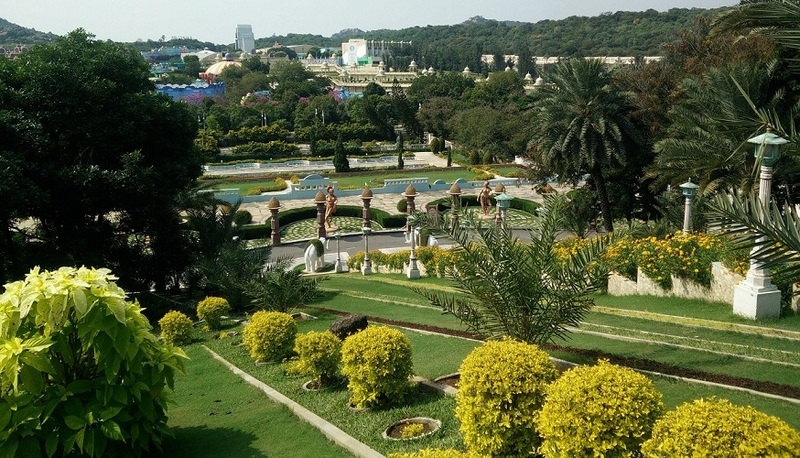 One of the many gardens at Ramoji Film City. Photo by Archana Nathan. 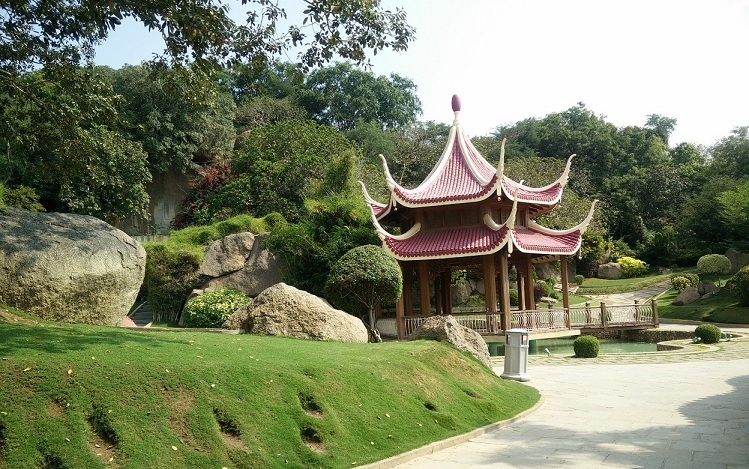 The Japanese garden at Ramoji Film City. Photo by Archana Nathan. The other advantage of a studio backlot is the luxury of working without interference. “These backlots provide not only the ready-made sets but the secluded environment that is necessary for production to take place without any constraints and with a single-minded focus,” the film city executive said. 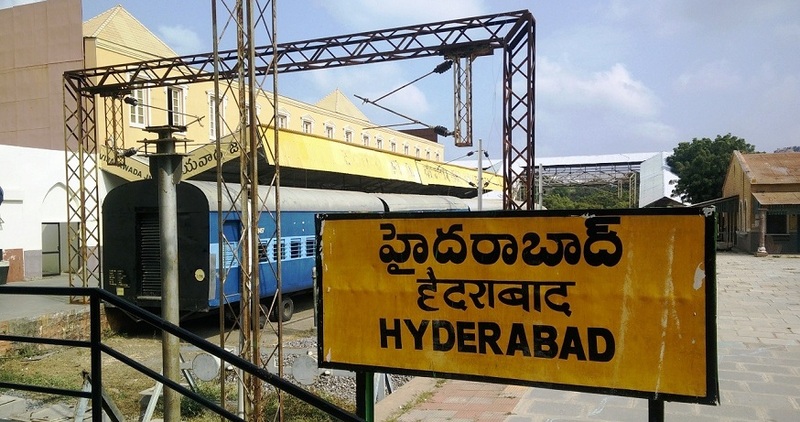 Hyderabad railway station (not the real one). Photo by Archana Nathan. 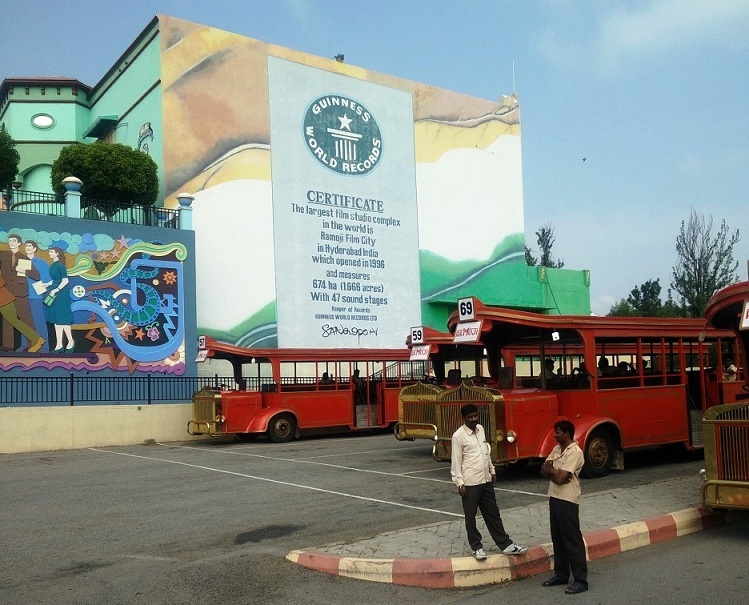 It isn’t entirely surprising that a few years after it was built, Ramoji Film City was thrown open to the public. Apart from the movie sets, visitors who pay a minimum entry charge of Rs 1,250 can also visit theme parks, amusement rides, adventure games and shows. The film city also rents out its space for weddings, honeymoons and theme parties. 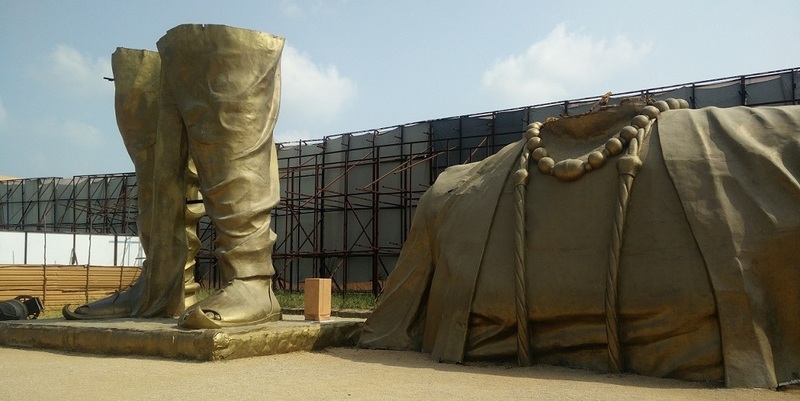 ‘Come be our kings and queens in Ramoji Film City,” a disembodied voice announces at the central square of the complex. 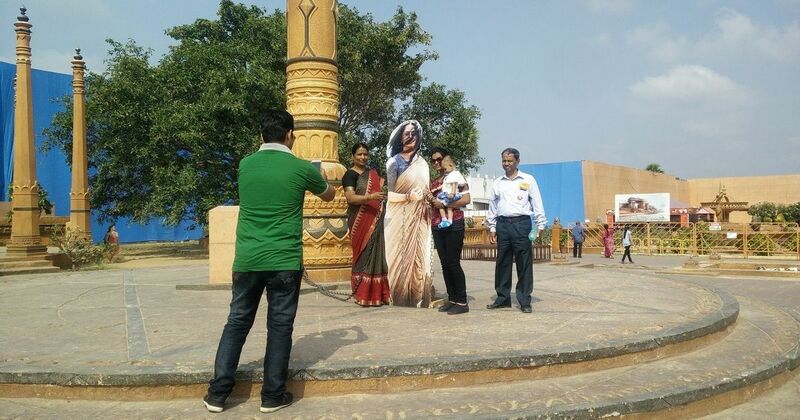 Clearly, everything is about show business while you are at Ramoji Film City. And not just for filmmakers.